Can be used in the field (Pelican or similar waterproof case for netbook and interface box recommended!). The Classic Fluorometer USB Standard 50m is designed for ease of handling, with the cable extending from the base of the sensor. The sensor is waterproof to 50m/164ft depth. 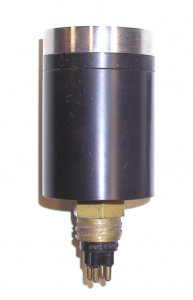 In combination with the optional light pipe assembly and the Submersible Datalogger, this sensor can be used in underwater applications where a robust and waterproof design is required. The sensor enables convenient measurement of wet material including aquatic plants, algae and wet leaves. The small size of the fluorometer (1.8″diameter, 2.7″ long), and its 12-24V capability makes it easy to use in the field. On commencing measurements, one establishes a suitable gain setting with a sample leaf and a zero offset value in air or water. Chlorophyll-containing samples are then simply placed over the sampling window for single or repeated measurements. An optional clear light pipe extension enables measurement of samples 0.5m from the sensor; this is particularly useful for long term measurements where shading of the sample must be avoided. The Classic Fluorometer USB Standard 50m is designed to be operated underwater or in the field with the Submersible Datalogger. 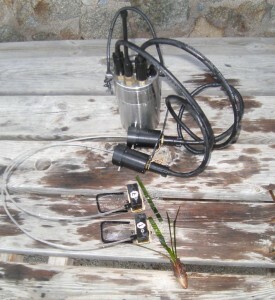 The light pipe extension and sample holder enable continuous monitoring of a leaf, coral or alga for extended intervals where the shutter is not required. The Classic Fluorometer USB Standard 50m can also be operated from a PC (Windows XP and later) via a standard USB cable. Both the power supply and computer are connected to the interface enclosure. A water resistant cable runs from this enclosure to the fluorescence sensor. All items are contained in a lightweight carry case that is small enough to fit in a shoulder bag. The optimal maximum length of the cable to the sensor is 20 m; for measurements to be made in deeper water please see our Classic Submersible Fluorometer Systems. AquationDirect is the proprietary software used to communicate with the fluorometer. The simple uncluttered approach hides features when they are not required, providing a more enjoyable user experience. There are three levels of control. “Profile” defines settings for each measurement (measuring light intensity, saturating pulse intensity etc.). “Program” defines a sequence of yield measurements, actinic treatments and far-red light treatments. The intensity and duration of each light can be defined. A Light Curve and Recovery Curve generator provides flexible generation of curves with user defined actinic intensities and durations. Even reverse light curves can be defined if required. “Schedule” simply schedules a series of Programs, where one may wish to run different programs during the early morning program, midday, afternoon and night time. Please use the Contact Form to make further enquiries. Copyright © 2017 Aquation Pty Ltd. All Rights Reserved.